Let’s go through a scenario: You purchased your first RV, and you’re eager to break it in on a nice cross-state adventure. You already know where you plan to go and you’ve read some reviews on a great nearby RV park. You go online to book a site, and you see some choices for types of sites. You see two types of sites: Pull through sites and back in sites. You likely don’t need a huge description, you must back into a back in site, and you drive through a pull-through site. There is a price difference, and you start thinking about it more. Which one is right for me? Well, that answer will depend on a few things. Let’s look at back in vs. pull through sites. 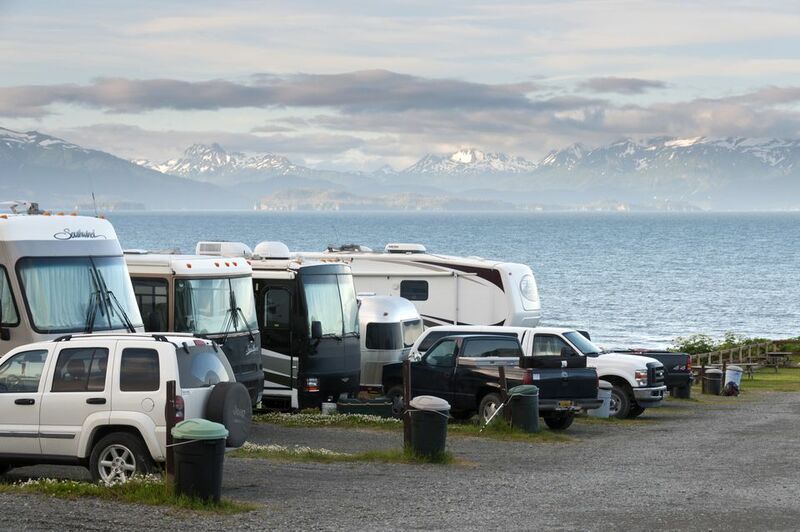 We’ll review some of the not so obvious differences along with the pros and cons of each, so you know what type to book before you have any problems at the RV park. What seems obvious to seasoned RVers might be foreign to RV newbies. In a back in site, there is only one entrance/exit, so you must back into the site for the utilities to be on the correct side of the RV and you have an easy time hooking up. Back in sites are smaller, but this will vary from site to site. There are some back-in sites that can accommodate diesel pushers, fifth wheels, and other types of larger models. You don’t always have to back into a back in site. Back in implies that you need the back to have the utilities on the driver’s side of the vehicle where the connections are closest and most convenient. If you’d rather run connections under your RV to have your rig turned towards the best view, then go for it in this type of site. Pull in thru sites are designed to be easier on the driver by allowing you to drive forward in through the site entrance and continue pulling forward and out to exit the site. Like back in sites, the utilities will be on the driver’s side of the site. Back in sites are cheaper than the pull through sites. If you are more concerned with saving money rather than convenience than the economy of a back in the site should appeal to you. Size: Back in sites are usually smaller than their pull through counterparts, but this is not always the case. Make sure you compare the dimensions of your back in site to the dimensions of your RV to make sure you don’t have a nose sticking out along a service road or path. Backing in: If you have a large RV or large travel trailer, you may like the idea of having to back it up to squeeze it into a tight space. Backing in is more subjective if you aren’t worried about your skills in reverse then a back in the site should be okay. Convenience: The reason people tend to choose pull through sites is the convenience. You drive in, hook up your utilities that are on the correct side already, and drive out when you’re done. This is a good strategy for larger models that can be a beast to back up in. Size: Because they’re designed to accommodate larger models pull through sites offer more space than back ins. If you have a large RV or want a lot of space for your patio area and other amenities then a pull through is right for you. Because they are larger, pull through sites are often more expensive than back ins. If you favor convenience over the economy than a pull through is the site for you. It sounds obvious at first but gets a little more complicated the more you think about it. In the end, choosing a back in vs. pull through almost always comes down to personal preference and you will likely still have an enjoyable time regardless of what site type you choose.